This blog is a joint project of brother and sister team, Mik and Kjersti. Mik is currently a 16-year-old high school junior. 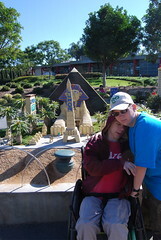 Mik does not like to talk much about his early life other than he was born three months early resulting in him having cerebral palsy. He was able to walk with a walker most of the school day for a few years, but lost that ability when he hit his preteen years and grew faster than he could maintain muscle control. He has had several surgeries over the years and with the help of a baclofen pump has gotten back into using a walker in physical therapy. However, anything he does outside the home he does in a wheelchair as it allows him to actually enjoy doing things rather than wasting all his energy trying to walk with his walker. Kjersti is a 23-year-old experienced world traveler, who had been to every continent (including Antarctica) at least once before she turned 18. Much of the traveling was done when Mik was younger and without him, but more recently she has tried hard to give Mik similar travel adventure experiences like she got to do. This started with a 75-day road trip to all 30 Major League Ballparks in the summer of 2009, which she chronicled in our All the Ballparks blog. Recently we began planning our summer 2011 adventure of an Alaskan Disney Cruise for our mom's 50th birthday and rediscovered the reoccuring challenge of wheelchair accessibility when traveling. We have decided that it is time we finally create our own blog to share our adventures and misadventures related to wheelchair accessibility and travel. The main focus will likely be on wheelchair accessibility reviews of places we visit, but we also plan to do posts on planning our travels and general travel blog posts updates like we did with our All the Ballparks blog. I love your blog! There aren't very many wheelchair accessibility travel blogs out there so all the information is much very appreciated.